Mayaguez, PR June 30, 2015– Ph.D. candidates Chelsea Harms Tuohy and Evan Tuohy of the University of Puerto Rico, Mayaguez Department of Marine Science are developing a new software for tablets that will revolutionize the way scientists conduct fish surveys underwater. 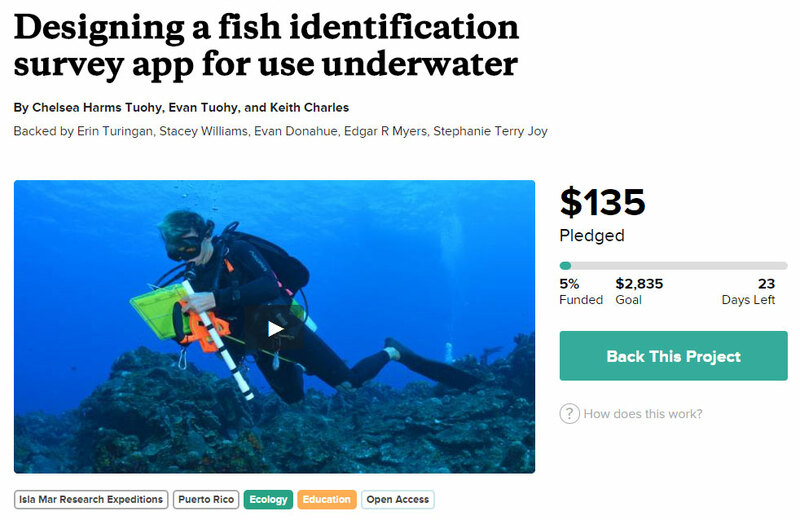 On June 23, 2015, the Tuohys unveiled their app idea on social media, announcing a campaign to raise funds for the project on the scientific crowdfunding site, Experiment.com. The campaign is active until July 23, in which they hope to raise $2835 or more. The project can be found at www.experiment.com/fishid or www.experiment.com/fishapp . The app is currently in development by Keith Charles – a Chicago, IL based independent software designer. The name and final product are scheduled to be released in late 2015. The app will be freely available to all iPad users, and an Android version is scheduled to be released in early 2016. The company founded by Chelsea and Evan Tuohy – Isla Mar Research Expeditions – is the face of the application. The company was established as a field course coordination and teaching institute for undergraduates and field researchers. After instructing new fish biologists in Caribbean reef fish identification, they realized there is a steep learning curve to this fish identification technique. They sought to find a more efficient and faster way to teach these new scientists how to identify fish underwater, and increase the reliability of the data they collect. They are seeking the most cost effective solutions to make this technology available to all budgets. Students and citizen scientists are their inspiration; they are working on collaborations to identify budget-friendly alternatives to more expensive tablets and underwater housing. Who will use the App? The app is designed as a teaching tool to assist students, field researchers and citizen scientists. There are many volunteer-based organizations that rely on divers to census fish around the Caribbean and Western Atlantic. The quality of their data will be enhanced by this app, and inexperienced fish surveyors will quickly be familiarized with the fish and can learn the basics without the help of an expert. The company is also building a more robust version of the app which will be utilized by experienced fish biologists for field data collection. Isla Mar Research Expeditions will use the app to train students and scientists in Puerto Rico. They will also visit other Southeast Atlantic, Gulf and Caribbean organizations and universities to train workshop leaders and field instructors on how to use this technology.